Comicrazys has a wonderful collection of paintings by Floyd Gottfredson up on their website. Between 1978 and 1983 the legendary cartoonist made a total of 24 paintings commissioned by collector Malcolm Willits. 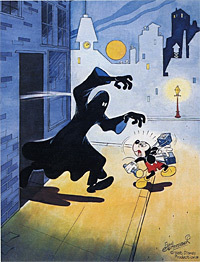 Each of the 24 paintings is based on a storyline from one of Gottfredson’s popular comic strips. He wrote and drew hundreds of newspaper strips starring Mickey Mouse and the gang from 1930 up to his retirement in 1975. His work had been printed in newspapers, magazines and comic books around the world, but as a Disney employee he was never allowed to sign it. Gottfredson’s identity was finally revealed in the mid-1960s by fan Malcolm Willits. Subsequently, reprints of his Mickey Mouse strips in the 1970s gave him credit.